Combine 1/4 corn syrup, brown sugar and margarine in medium saucepan. Cook over low heat stirring occasionally until mixture begins to boil. Remove from heat. Add crispy rice cereal stirring until well coated. Press evenly into 9-inch pie plate to form crust. Stir together peanut butter, fudge sauce and 3 Tablespoons corn syrup. Spread half the peanut butter mixture over crust. Cover and freeze until firm. 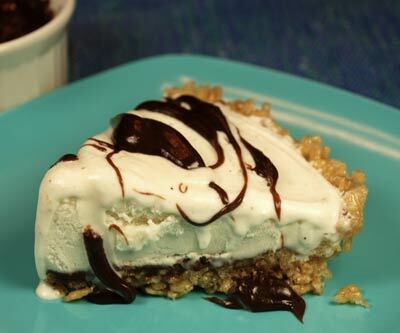 Allow ice cream to soften slightly and spoon into frozen pie crust, spreading evenly. Freeze until firm. Let pie stand at room temperature about 10 minutes before cutting. Warm remaining peanut butter mixture and drizzle over top of pie.